Queen of the South inch three points clear of the Scottish Championship relegation zone after drawing with Morton. Gary Naysmith's side went ahead three minutes before half-time through Kyle Jacobs' long-range effort. The hosts had chances to add to their lead but a string of saves from Robbie McCrorie kept Morton in the game. They took full advantage of those wasted opportunities after the break as Charlie Telfer rifled in the equaliser. The result means Queen of the South are three points above Falkirk, who occupy the relegation play-off spot in ninth, with Morton just one point better off in sixth. Queens face bottom side Alloa Athletic next week. Match ends, Queen of the South 1, Morton 1. Second Half ends, Queen of the South 1, Morton 1. Attempt saved. Andrew Dallas (Morton) right footed shot from the centre of the box is saved in the top centre of the goal. Corner, Morton. Conceded by Andy Stirling. Hand ball by Andy Stirling (Queen of the South). Corner, Morton. Conceded by Michael Doyle. Attempt missed. Ian McGrath (Queen of the South) header from the centre of the box is close, but misses to the left. Attempt missed. Reece Lyon (Morton) right footed shot from the centre of the box misses to the right. Attempt blocked. Stephen Dobbie (Queen of the South) header from the centre of the box is blocked. Corner, Morton. Conceded by Scott Mercer. Attempt missed. Stephen Dobbie (Queen of the South) right footed shot from the centre of the box is close, but misses to the left. Attempt missed. Ian McGrath (Queen of the South) header from the centre of the box is high and wide to the left. Barry Maguire (Queen of the South) wins a free kick on the right wing. Lyndon Dykes (Queen of the South) wins a free kick on the left wing. Attempt missed. Josh Todd (Queen of the South) right footed shot from the left side of the box is just a bit too high. Iain Wilson (Queen of the South) wins a free kick in the defensive half. Goal! Queen of the South 1, Morton 1. Charlie Telfer (Morton) left footed shot from outside the box to the bottom left corner. Substitution, Morton. Andrew Dallas replaces Gary Oliver. Substitution, Queen of the South. Ian McGrath replaces Kyle Jacobs because of an injury. Attempt missed. Gary Oliver (Morton) header from the centre of the box is close, but misses to the right following a fast break. Attempt saved. 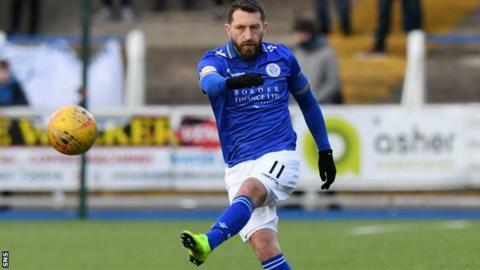 Stephen Dobbie (Queen of the South) right footed shot from outside the box is saved in the bottom left corner.